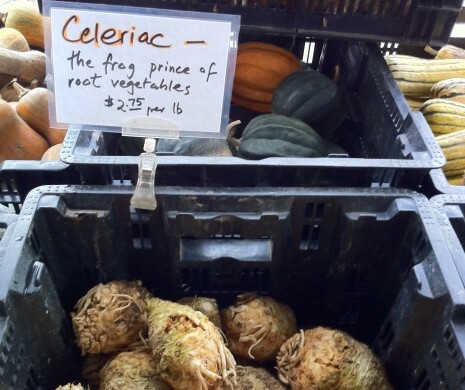 CELERY ROOT, THE FROG PRINCE | Jane Lear. Writing on Food and Travel. New York, October, 1978. The restaurant? Les Pleiades. Tucked in the Surrey Hotel, at 20 East 76th Street, it was one of the city’s classic French “red room” restaurants and a legendary gathering place for art dealers, collectors, auction-house experts, and museum directors. The first course on everyone’s plate? Céleri rémoulade, impeccably cut matchsticks of raw celery root (a.k.a. celeriac) tossed in a tangy mustard sauce. I’d been invited out to dinner by Jim Williams, an antiques dealer and preservationist from Savannah, in town on business. This was a few years before his arrest and subsequent four trials for the murder of his assistant (the subject of John Berendt’s Midnight in the Garden of Good and Evil), and he was in great form, happy to acquaint me with one of the best salads in the world. On the plate, it was simple, almost stark. The first forkful changed my life. I’d never eaten celery root before, and the flavor was haunting, elusive. It was suave. The following summer, when I finally got to France, I discovered it was on the menu of almost every bistro. I practically lived on the stuff. 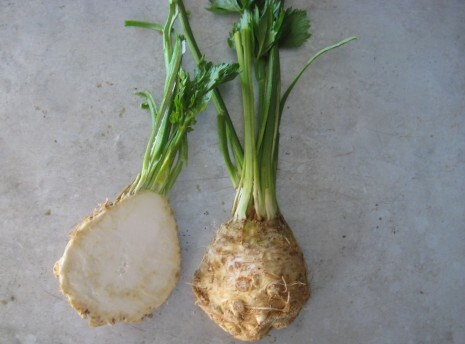 Celery root and regular bunch celery are different varieties of the same plant, but celery root has a milder, more complex flavor. Its mellow roundness never fails to swing me joyously into fall. In fact, I know it is fall when I see crates of celery root at the Union Square Greenmarket, for the crop takes a long time to reach maturity. Purveyor Keith Stewart, who fondly calls celery root “the frog prince of root vegetables,” sows seeds in his greenhouse in early March. “We transplant to the field in May,” he says, “and usually don’t harvest until September, October, and November.” The fact that Keith’s celery root is organic is a big plus as far as I’m concerned; I like knowing that anything that sits in the ground as long as celery root does is absorbing nothing but nutrients from the soil. When eaten raw, as in rémoulade or simply sliced, alongside a sandwich, celery root’s fine-grained texture and herbal sweetness shine. When cooked, it doesn’t turn starchy like so many root vegetables, but instead becomes velvety, giving body and boost to creamy soups or purées. It’s fabulous braised with bacon and onions, as in Volume 1 of Julia Child’s Mastering the Art of French Cooking, or cut into pieces and tossed with nothing more than olive oil, salt, and pepper before roasting until tender and golden. It’s hard to believe all that finesse comes from such a gnarly, impenetrable-looking vegetable—the sort that people pick up, wonderingly, in the supermarket produce aisle, then put down before wheeling their shopping buggies over to the potatoes. In truth, celery root is nothing to be afraid of, for it’s perfectly straightforward to prep. Give it a good scrubbing first, because it can be sandy. Whack off the top and bottom, then use a sharp paring knife (a peeler isn’t up to the job) to remove the thick, warty skin, working from top to bottom. The creamy white flesh of celery root oxidizes fairly quickly, so if you are dealing with several of them, plunk the peeled roots into a bowl of lemon water. To cut celery root into matchsticks, you have three options: a food processor fitted with the julienne blade; a mandoline or Benriner-type slicer; or a sharp large knife. Unless I’m making céleri rémoulade for lots of people, I tend to use a knife; dragging the food processor out of its hidey-hole (our kitchen is the size of a postage stamp) seems like more trouble than it’s worth, and trimming the root to fit a mandoline can be fiddly work. If you opt for this low-tech method as well, here’s an efficient way to go about it: Cut a peeled whole celery root into thin slices (about an eighth of an inch thick) with a large knife. Then cut a stack of three or four slices lengthwise into strips of the same width. The other day, I found myself rushing through the task. I’m not sure what made me stop and think of Les Pleiades, but picking up my knife again, I tried to make my matchsticks as flawless as possible. Céleri rémoulade makes a wonderful first course for ham, a pork roast, duck, you name it. It’s a great company dish, because you must prepare it in advance. If there are any dregs left in the salad bowl, save them for the morning. They are delicious (like almost anything) on hot toast. 1. Put the celery root, salt, and lemon juice in a bowl and toss well. Cover the bowl and marinate the celery root in the refrigerator for at least 30 minutes and up to 1 hour. 2. In another bowl, whisk together the mustard, lemon juice, vinegar, and sugar, with salt and pepper to taste. Whisk in the oil in a slow stream. 3. Drain the celery root and return it to the bowl. Dress it with the mustard sauce, tossing well to coat. Refrigerate the salad, covered, for at least 1 hour and up to 3 hours. Decorate with herbs (as Julia would say) just before serving. Posted: October 12th, 2011 under autumn, cookbooks, cooking, people + places, recipes, restaurants, Union Square Greenmarket. I was just trying to explain to someone what celery root was. Of course, twice my age, she had never heard of it. The only reason I have experienced it was the fact that I grew up in South America (venezuela). My parents ate out a lot,and surprisingly, for such a very small town in a 2nd world country, the food was very diverse (and very Italian!). I don’t remember where or when, but somewhere I had a cream of pumpkin soup, that was not like any cream soup I’d ever had. (At the time, I did not eat sweet potatoes, or pumpkin pie, or really anything mushy-orange-sweet). I think it was the first time I ever asked what was in a dish: pumpkin and celery root. I still think about that soup, and one day, when I find some celery root (it’s not in the stores very often), I’m going to make some soup, maybe with a butternut squash.